Astronomers have discovered three brown dwarfs -- enigmatic objects that are neither stars nor planets -- emitting radio waves that scientists cannot explain. The three newly-discovered radio-emitting brown dwarfs were found as part of a systematic study of nearby brown dwarfs using the National Science Foundation's Very Large Array (VLA) radio telescope. Until 2001, scientists believed that brown dwarfs, which are intermediate in mass between stars and planets, could not emit detectable amounts of radio waves. 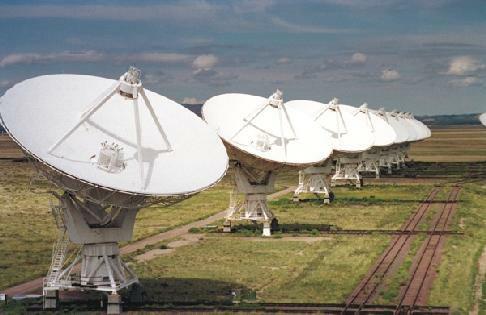 That year, summer students at the VLA made the first discovery of radio emission from a brown dwarf. Subsequently, as many as a half- dozen more radio-emitting brown dwarfs were discovered. "It clearly had become time to make a systematic study and try to find out just what percentage of brown dwarfs are emitting radio waves," said Rachel Osten, an astronomer at the National Radio Astronomy Observatory (NRAO) in Charlottesville, Virginia. Osten was assisted in the project in the summer of 2004 by Lynnae Quick, a student at North Carolina Agricultural and Technical State University; Tim Bastian, also an astronomer at NRAO; and Suzanne Hawley, an astronomer at the University of Washington. The research team presented their results to the American Astronomical Society's meeting in San Diego, CA. The three new detections of radio-emitting brown dwarfs are just the first results from the systematic study, which aims to observe all the known brown dwarfs within about 45 light-years of Earth. "We want to be able to say definitively just how common radio emission is among brown dwarfs," Osten explained. The study involves observing 65 individual brown dwarfs, so these new detections represent just the beginning of the results expected from the study. Brown dwarfs are too big to be planets but too small to be true stars, as they have too little mass to trigger hydrogen fusion reactions at their cores, the source of the energy output in larger stars. With roughly 15 to 80 times the mass of Jupiter, the largest planet in our Solar System, brown dwarfs had long been thought to exist, but proved difficult to find. Astronomers found the first brown dwarf in 1995, and a few hundred now are known. The type of radio emission seen in the brown dwarfs arises in more-massive stars as a result of plasma interacting with the star's magnetic field. However, astronomers have noted that this type of activity declines in less-massive stars. This is why they expected brown dwarfs, with masses less than that of any star, to lack radio emission. Surprisingly, based on discoveries since 2001, it now appears that radio-emitting magnetic activity may actually become more common in these very low-mass objects. "We don't have an explanation for this," Osten said. The scientists hope that brown-dwarf radio emission may give them a new tool for analysis. "Since both stars and the planets in our Solar System produce radio emission, detailed study of the radio emission properties of these brown dwarfs may enable us to distinguish where the boundary between stellar and planetary behavior occurs in these not-quite-stars, not-quite-planets," Osten explained.